This is my second entry, SEE YOU MUST PICTURE/VODEO 'HUM LOOT CHUKE SANAM' by Sanjay Gandhi. Do Indians have guts to get this Italian lady and her puppets out to save mother India? in the streets against rising cost till she is unburdened. dancing (as we see in the picture above) at her call. Mr. Mishra, show me a better picture. She got her training in an eatery where she got more in tips than in salaries. It is best not to mention her other income, others had their fun and left but an idiot got hooked and we are paying for his idiocy! So, I posted it on facebook. Most appropriate cartoon of the day. It says it all. Mr. Malik, Mr. Joshi, Mr. Murthy and Mr. Bhattacharjee- Thanks to all of you for valuable comments. I think, Sonia (being head of the state) is mother of all the scams, be it 2G, Colagate or Commonwealth. This is the nature of Indian politics. Corruption is on height and there are several politicians who make sure sending the 'cut of the loot' to their respective high commands. Thanks once again! Very topical cartoon... I can't underestand why a wave of scams has hit India in such a short time? Nothing could be more expressive! 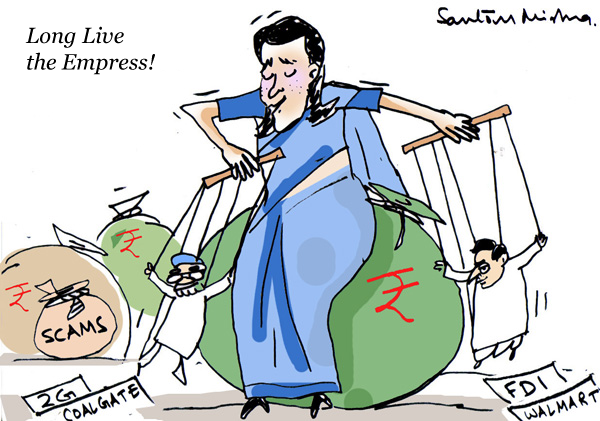 The caricature of Sonia captures the state of the nation. Well done. wonderful comment in graphics and visualisation. silence is sonorous than words..